Liberally wet your face and apply shaving cream. 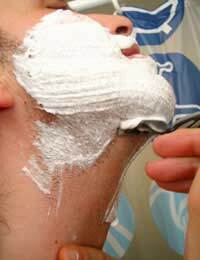 Wait 2-3 minutes before shaving. The use of a shaving cream that contains vitamins and Aloe Vera is preferable over brands which may contain skin irritants such as sodium laurel sulfate.